October 29, 2014, 10:44 a.m.
Former Massachusetts Governor Mitt Romney, the 2012 Republican Presidential nominee, remains among the most popular of possible 2016 Republican candidates – but just among Republicans. In the latest Economist/YouGov Poll, 75% of Republicans hold a favorable opinion of Romney, far more than say that about nearly all other GOP possibilities. Only former Arkansas Governor Mike Huckabee matches Romney when it comes to popularity with GOP partisans. Most of the others current being discussed have favorable ratings in the 60s. Ever fewer Republicans – 47% -- are favorable towards New Jersey Governor Chris Christie (and nearly as many - 37% -- are unfavorable). 47% also express favorable opinions of the much less well-known Wisconsin Governor Scott Walker. But just 8% of Republicans are unfavorable towards Walker. 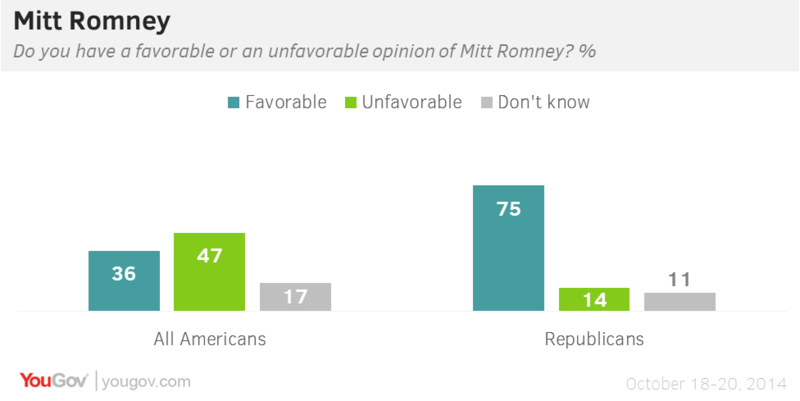 Romney’s popularity with Republicans does not extend to the rest of the population, however. Overall, he is seen unfavorably. 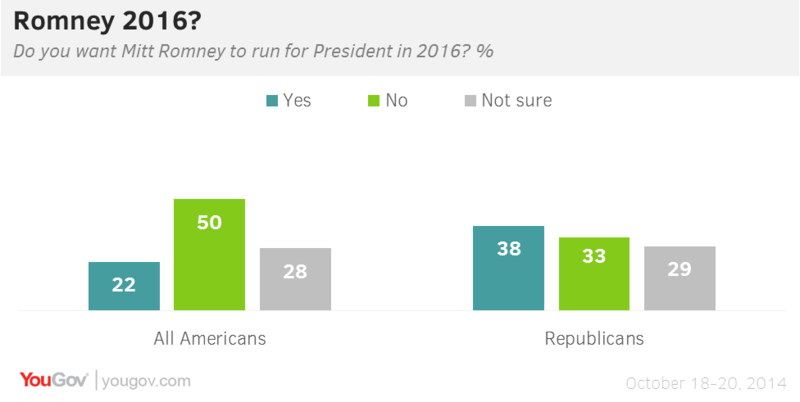 And when it comes to whether or not Romney should try again for the Presidency in 2016, Republicans are divided at the moment. The country overall would rather he stay out of the next presidential contest. 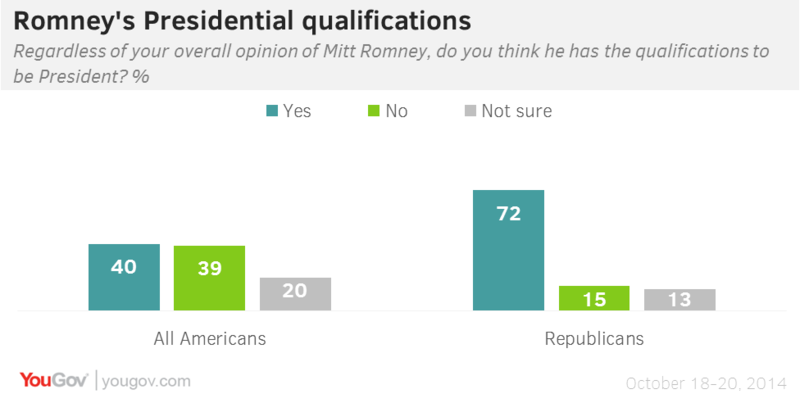 One advantage Romney retains from his 2012 run is that Republicans overwhelmingly view him as qualified for the job: nearly three in four Republicans believe he has the qualifications for the job. That is a requirement first time challengers sometimes have a hard time meeting. Romney stands out this year among Republicans when it comes to experience. Republicans (61%) also have confidence in Romney’s ability to handle an international crisis, although the public overall (32%) is still dubious. When compared to the Democratic frontrunner, Hillary Clinton, Romney evokes very different gut reactions. Those who like Romney and say they think favorably of him (a group in which Republicans dominate) highlight one characteristic over all others – honesty. 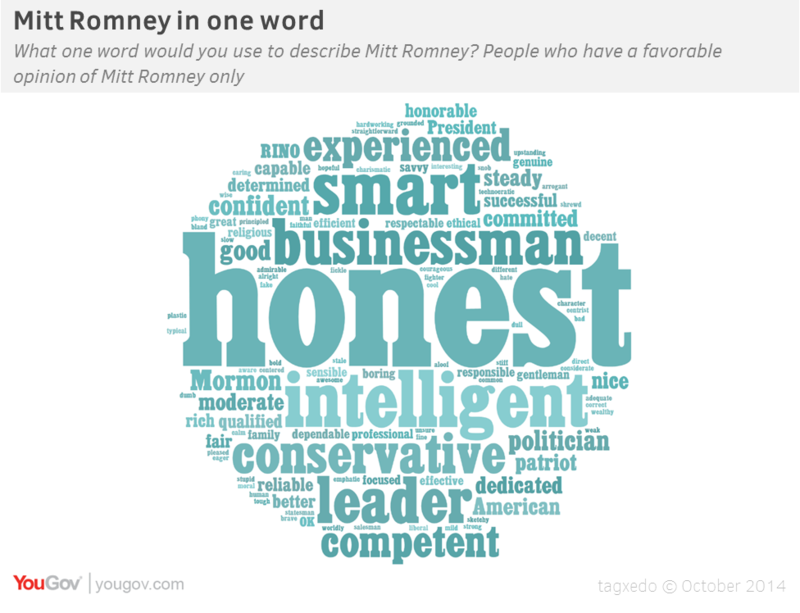 It is by far the most-mentioned characteristic volunteered by those with a favorable opinion of Romney. It dominates the word cloud of those answers. When asked directly, more than half of Republicans believe Romney has more honesty and integrity than most people in public life; in addition, two-thirds of Republicans think Romney mostly says what he really believes. 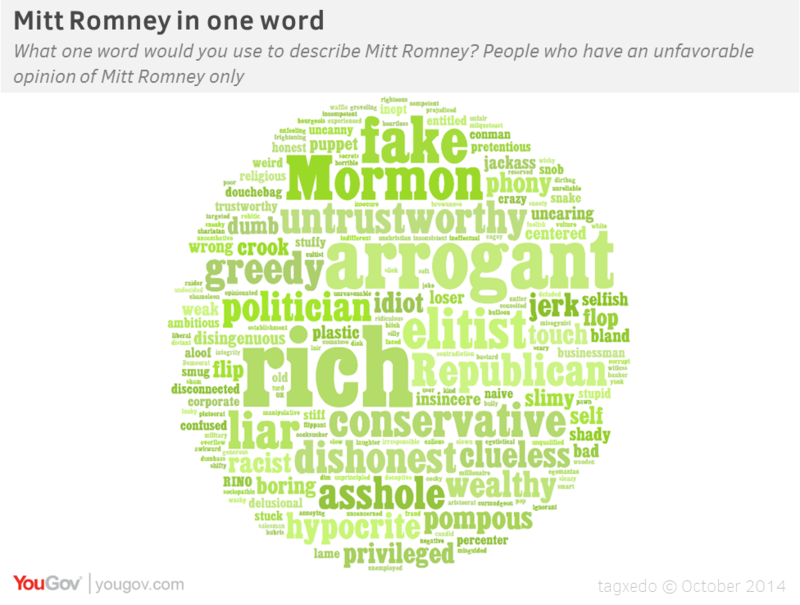 What people don’t like about Romney includes his wealth. Some call him “arrogant” and others look at him as untrustworthy. In June, Clinton’s positives focused on what those who liked her saw as strength, experience and intelligence. In most Economist/YouGov Polls, more have a favorable opinion of Clinton than hold an unfavorable one. This week, the assessment is close: 46% favorable and 45% unfavorable. 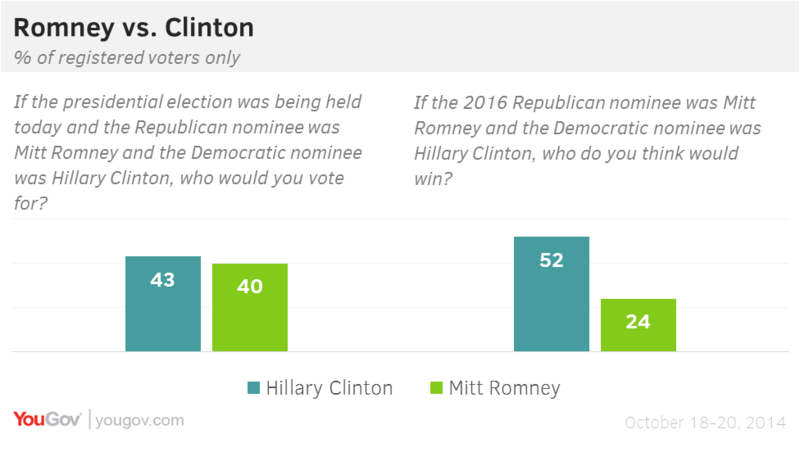 Although one in four Americans and nearly one in five registered voters don’t have an opinion yet, Clinton does outpoll Romney when people are asked whom they would vote for if these two candidates were running in 2016, although her margin with registered voters is narrow (she has an 11-point lead when this is asked of everyone). 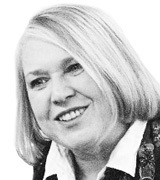 And while both possible candidates lost their last presidential race (Clinton the 2008 Democratic nomination contest and Romney the 2012 general election), Clinton is seen as the more 2016 likely winner – and by more than two to one – should the two race against each other in two years.